If you are an aspiring musician and you want to invest in the best congas the market has to offer, our concise guide should be relevant and full of surprising options. For starters, we should mention that we put it together by going through expert reviews and by analyzing top-notch products that take sound quality to a whole new level. One model that stood out is the Latin Percussion Wb2040 World. This model is made from sturdy materials that won’t wear out in time, it is light enough that the product can be carried from one room to another with ease, and it has a traditional tonality that many will appreciate. Another alternative just as impressive is the Meinl Percussion HC512WRB. The first time you’ll see this model, you will be impressed. Its smooth body makes it look amazing in any kind of setting, and you would not guess, at first glance, that it comes with a pretty decent price tag. Experts say that this model is particularly good for beginners, but people with more experience will also find it easy to play. You won’t have to strike the top surface with too much power, as it is quick to produce the desired sound, which comes out loud and robust. Some buyers report that the strap is cheap and not very comfortable. A beautiful instrument that is ideal for beginners and advanced players alike. You will get not one, but two congas with this set, and that’s great especially if you’re planning on playing different styles. While they are full-size, they are not as heavy as you might expect, and carrying them around will not be a problem. The sound quality, however, is what recommends them most. They are able to produce a warm sound, and there is no distortion, which is a great plus. Given the affordable price tag, the congas impress through quality. You might have to tune them, and that will be an added expense. 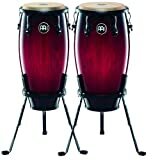 A set of two congas for players who want to try different styles of music; they’re also full-size congas. One look at this model may tell you that it is not exactly what you were expecting of it. But, regardless of the innovative design, you will be able to use this model just like you would any conga. It is a hybrid instrument, and it will help you produce both high and low pitch sounds. It is worth mentioning that it comes with a strap, so you will be able to carry it and play comfortably. Unlike other congas that take up a lot of room, this one is very portable. It might take a bit of practice to get the kind of sound you want from it. A portable, hybrid instrument that will let you play wherever you want; it comes with a strap. When it comes to options that steal the spotlight, the ones below will surely live up to their praise. We’ve only picked those that will satisfy even demanding customers, that are beginner-friendly and which can deliver crystal clear sound even in a noisy room. Let’s have a look. This product is more than a drum – it is a piece of art. It has a smooth body, and when it comes to aesthetics, it won’t disappoint. Most buyers describe it as the perfect drum for young players and inexperienced drummers just starting out. However, this doesn’t mean it can’t be used by experts just as comfortably. Another standout is the sound quality. The piece produces clean and powerful notes, without having to apply a lot of power. The tonality is warm and joyful, and this quality is constant, not just from time to time. Adding everything up, it is easy to see why musicians appreciate it so much. It is small so that you can strap it over the shoulder for a comfortable playing session, and the body is strong enough that it will survive transportation while on the road. It is 21″ tall and it has a 9″ head, and also note that it is made from dried Siam oak. If you want not one, but two congas, then this set is what you need. It comes with two units – an 11″ one and a conga that measures 12″, all so you can play different types of music without sacrificing anything. The pieces are full-sized, but despite that, they are quite light and you can transport them easily. Buyers describe their tonality as being warm and pleasant to the ear. Moreover, they have excellent projection and no distortion. It’s actually impressive when you compare the product’s premium quality to its reduced price tag. This set is ideal for helping you improve your skills, and it is sturdy enough that you can practice daily without even scratching the drums. The units are 28 inches tall and are made from wood and rock buffalo heads. The high gloss finish makes them easy to clean and are nice to look at as you’re practicing. Modern congas have their own unique benefits. And this redesigned product will show you in no time that you made a wise investment. The LP Laptop Conga is called a hybrid instrument which produces complementary high and low pitches from a unique portable design. The body of the model is made from highly durable materials, and it includes a sturdy strap so you can play it comfortably. Moreover, you get the sound of a traditional drum and a quinto setup for half the price, which is a welcomed bonus. It is ideal while traveling or if you lack storage space. This unit will never require tuning or set up, a convenience that most inexperienced musicians will appreciate. The pitch of the hybrid conga is impeccable, and the clarity is enhanced since it is constructed from birch wood. It does have a more modern sound, but you can comfortably play traditional tunes without any issue whatsoever. When it comes to stunning pieces of art, this model takes the crown. The set’s design is refined and clean, and in combination with the sunset colors of the drums, you could even use the items as decorations, not just for their main purpose. For a small price, you get two polished units: a 10″ one, and another that doesn’t exceed 11″. They are made of Siam oak, a material known for its durability and for the fact that it ages well, without damaging the tonality or the clarity of the sound. Additionally, note that they are 28 inches tall. The hardware is coated in a black powder, and the bottom of the pieces is covered in rubber, to prevent them from slipping as you play them. If you want to play the drums sitting up, you can make use of the high-quality stand the seller offers in the package, so you won’t have to buy one from another source. This conga is ideal for traveling musicians. It has a very compact design, and it weighs very little, which means you can even carry it in your backpack. And the even better news is that it doesn’t lack when it comes to sound quality. On the contrary, it has a bright tonality, rich sound, and accurate notes. The unit delivers the real conga sound since it is crafted from wood like most full-size congas are. Furthermore, the piece is cleverly designed to resist fluctuations from temperature or humidity and to offer high performances in any environmental conditions. Other benefits are the fact that it can be played on your lap or mounted on a stand, and that it measures 11.75″. For those who lack a music room, it can be the perfect alternative. It is also useful for those who want to experiment with the instrument, but they don’t want to pay for a traditional model, which has a higher price tag. The famous line of Lp Conga drums is exciting. And this model is one of those rare ones recommended by all musicians. The dimensions of the elegant instrument are balanced, so it can be placed in any room, and it weighs just 27.6 pounds. This product also delivers a strong and compelling sound that will leave you satisfied. Specifications wise, the model is crafted from top-quality Siam oak, and it features a natural rawhide head, like in all other high-class conga drums. The EZ curve rims were added to provide a pleasant playing and practice experience. The side plates are coated with a special black powder to make sure they can last in time, a small improvement that is going to double the lifespan of the product. You’ll also appreciate the simple lines and clean design of the item, and the fact that it is quite easy to handle and play whenever you want. Here’s an amazing model that offers you the sound you need while still allowing you to travel light. Despite its insignificant and slim frame, Pearl’s Travel Conga delivers you the unmistakable sound and feel of a full-sized piece. It is crafted from the same wood shell as the brand’s premium congas. Tuning your piece is easy and accurate since there are only five bolts to adjust if you need to. Moreover, you don’t have to worry about temperature and humidity levels, because the Remo FiberSkyn 3 synthetic head gives it a joyful and expressive tone, no matter if hot or cold. The oak it is made from is treated to age like a pro and the model has a nice texture to make sure you won’t hurt your hand’s skin in case you miss the head. And for those creative musicians who want to customize the conga, most of its parts are easily accessible and removable. This instrument offers outclass performance and, more importantly, enhanced durability. It weighs just 3.15 pounds, and it is highly portable, a thing that makes it ideal for those who plan on touring the entire world. And it also gives stunning sound quality, which is surprising given its compact footprint. The crafting material was wisely chosen to enhance the model’s durability and to maintain the high standard the brand is known for. Its head is made from natural rawhide and the drum structure is formed by using high-quality siam oak. The Puerto Rico flag is printed with strong pigments that don’t wash away easily. The simple looking instrument is created with attention to detail and the amazing results are easily visible. People prefer it because it is convenient, especially if you lack storage space. We should also mention that it is affordable and easily maintainable if these are things that matter to you as a customer. LP’s stand allows the user to mount three congas at the same time in a tight configuration, which is both convenient and practical. The model’s quick mount brackets are easy to attach to any pre-drilled conga, and can be set so that one of the drums sits slightly higher than the other one. The support brackets are actually improved and they have been designed to offer more support in case you are a virtuoso player who is not afraid of a powerful song. The product is made from heavy-duty chrome steel, and its height is adjustable. The custom caster wheels with brakes allow you to move the stand with the congas attached, which is clever and will save you the effort of transporting the instruments from one room to another using force. The steel is treated against rust and the surface is resistant to scratches. It’s a heavy-duty model that won’t fail you when you least expect it to. If you need a durable mount that will meet all of your demands, this sturdy piece might be just that. The package includes the bongo mount and two mounting bars. The unit keeps the instruments secure, so you can play your tunes without worrying the drums will fall. The clamping style attachment is intuitive, so you won’t waste any time trying to figure it out. The model is suitable for a broad range of stands, which is a bonus worth noting if you are a serious musician who has a lot of gear in his or her arsenal. The chrome finish is pleasant to look at, and it gives the product an aura of elegance that will be appreciated by all your colleagues. Rust won’t be an issue, and it is ideal for heavy use. It’s something that should not miss from your music gear collection, especially if you appreciate comfort. The professional stand is unique because it has a foldable design and offers enhanced performances. It was primarily developed to accommodate the harsh conditions of road use, where fine adjustment, a scratch-resistant surface, and durability are demanded on a daily basis. It has a chrome-plated steel construction, plus a rubber crossbeam, and it can fold down to a tiny size for much easier transit. The patented piece can withstand heavy weights, and it can be locked in place once you’ve adjusted its height according to your needs at that specific moment. The silver color is highly classy and it can match any type of drum design and, more importantly, it won’t look out of place in any room. The feet of the stand are reinforced with a hard type of plastic so the product won’t slip on your floors as you practice, no matter if we’re talking about tile, wood or vinyl. It’s rather important to think about the type of sound you’re looking for before you go on and make a decision about the kind of good congas you want to buy. If you’re an expert musician, this should be an easy task, but if you’re a novice, maybe you need to look on sites like Youtube for how different the best congas sound like. The info we added below should help you make a clear and confident decision. What is a conga drum? Before we start, we should define the terms we’re working with. The conga or the tumbadora, is a single-headed drum with a sleek and narrow body. The instruments are divided into three categories. The first one belongs to the salidor or tumba, then we have the tres golpes or tres dos congas, and lastly, the quinto or the lead drum. When opting for more than one model, make sure they have a screw tensioned drumhead that can’t be moved around and that is not too elastic. Stay away from obscure brands, as the popular ones have years of experience, a thing that matters when it comes to creating cheap congas. You should also buy one of the many stands available on the Internet, congas reviews tell us. Make sure to pick one large enough to accommodate your drum. A seat would be a nice addition too, as you can play the instrument by sitting or by standing up. 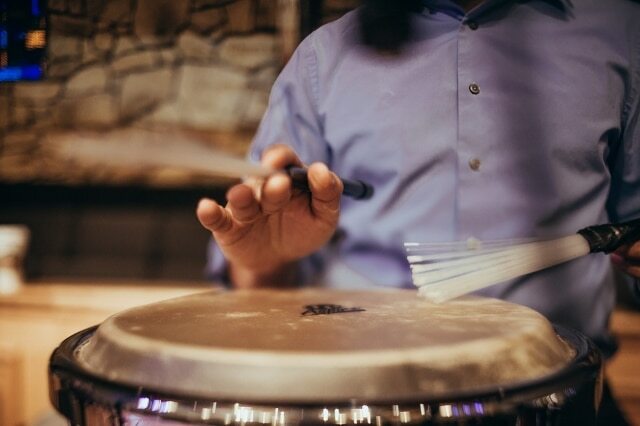 Conguero is the traditional term applied to experienced conga players, while those who dance to the rhythm of the hypnotic instrument are called rumberos. Note that there isn’t such a thing as the best congas for beginners, as it is all a matter of preference. A conga drum is usually a tall and narrow instrument, which is played with the fingers and palm of both hands. However, you can sometimes use other combinations like “the alternating method,” or you could just use one hand. The mysterious instruments are available in a wide range of sizes, as expected. The smallest models can be just nine inches across and they usually hang from a shoulder strap, to aid the drumming process. However, keep in mind that these are suited for small concert rooms, or for teaching purpose, as their sound is not incredibly robust. Experts recommend them for beginners or for those living in tight apartments. The largest congas are up to fifteen inches across and are considered the ultimate models. As previously stated, the size of the drum obviously affects the sound quality, volume and pitch of the instrument. The largest of these drums are being used to play the lower rhythms and melancholic conga songs, and, usually, they act as the “singer” of the orchestra. In addition, the pitch of the drum you buy will vary according to the model, the materials used for the construction of the product, and manufacturer. This means that before buying one, you should think about the room where you are going to practice the most. It might be clever to see if you share walls with neighbors that might have a problem with you playing the instrument at night. The clever inventions are traditionally made from hardwood, but nowadays, fiberglass and plastic models are also popular among trendy buyers due to the materials’ durability. Not to mention that modern congas for sale are also relatively inexpensive when compared to traditional products. 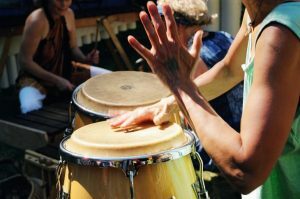 Tastes usually vary, but many professional and older players prefer wooden conga drums since they think the units produce a richer, warmer and more nostalgic sound than fiberglass models. It’s also a matter of authenticity, as fiberglass congas are suited for modern music, but not for traditional tunes. The latter ones can also be used in tandem with a multi-functional drum practice pad. Wooden conga drums are most frequently made from natural materials like oak or ash, and recently people have started using beech wood too since it is a highly flexible type of wood. There are many extraordinary models made from these woods, but you can even find combinations if that’s something that sparks your interest. Ash drums are seen as resonant, while oak congas combine a warm tonality with reduced overtones. The other huge factors to take into account when considering your preferred type are the drumheads themselves. These are made from rawhide, and this is still probably the best material available to this day. The best congas for the money will combine all the elements above. When it comes to your budget, don’t be afraid to spend a little more than what you originally planned. Fiberglass models are cheaper and ideal for those who might be a bit clumsy, as they have an extended lifespan. If you have money to splurge, don’t be afraid of wood items, even if they tend to scratch quite a bit. Going back to drum heads, which are the surfaces you strike when you play the congas, there are a few things to note too. For example, natural, animal hide products have a much softer surface and allow you to connect in a more intimate way to the drums. However, if you are a vegan, a synthetic surface can be just as good, as long as you make sure you avoid hot environments because heat makes synthetic drum heads weaker and bouncier, which is not always a good thing. Also, don’t forget that you don’t need a premium and expensive drum stick to play this instrument – just your hands. Some people have noticed that all-natural models are suited for Cuban and Latin music in general, while synthetic items make great instruments for those who like to experiment with modern music. Another super impressive selling point is the fact that congas are great for developing a musical sensibility and are quite easy to figure out. People might not know this, but you will sometimes have to tune the products. You can’t do that with a high-tech guitar tuner, and you will have to invest in a professional product from the market. But if you want to invest in sturdy and foldable music stands, you don’t have to use models created specifically for drums. What size congas should I buy? The perfect size might depend on your preferences. Conga heads typically come in three standard sizes, but you can find additional sizes if you want a special model suited for a particular task. The small ones have an 11-inch head and are suited for smooth tunes that don’t require a lot of power. The middle size is the most popular and it doesn’t exceed 11.75 inches. Experts recommend you buy at least two of those, as most songs require a double setup. And lastly, there are the Tumbadoras, which measure up to 12.5 inches. The height might vary accordingly. The first step is to tune the instrument and to invest in a top-notch drum mic kit. Then, place the microphones at the top of your main drum, pointing at 45 degrees down. Make sure it stays at a decent distance from the player. Musicians don’t recommend placing the microphone on the bottom. Moreover, make sure it is aimed at the player, as this will make sure it will catch even the faintest sound. When hitting the head of the drum, avoid the area near the microphone as that might end up detaching cables or distorting the sound output, which is a recurrent mistake among beginners. To avoid that, you could use adjustable overhead drum mics. When was the conga drum invented? The drum has its origins in the wilderness of Africa and Cuba. It is likely a descendant of an unknown African drum, which was brought to Cuba by slaves, where it is now known as the Cuban Cajon. In the 1930s, the conga was given its classic barrel shape and it became internationally famous as a series of recordings have made it to national television in the USA. No one can pinpoint to an exact birth year, but it is thought to have surfaced in the mid-20th century. The sure thing is that it has been unstoppable ever since. How to measure conga head size? The best thing you can do is look online. If you know the model of the drum, you can look it up and see what Google has to say. It might even show up on the receipt if you still have it hidden somewhere around the house. However, if that is not the case, here’s what you could do. Find a ruler that is longer than your drum head and measure the diameter of the top of the instrument. Make sure you avoid measuring the metal edges, as those are not taken into consideration. If you own a premium congas drum set for kids, they should never be larger than seven inches in diameter. How to make a homemade conga drum? The truth is that the answer to that question is both simple and complicated. There’s a way to make a conga at home, but it is extremely laborious and complicated, and it is not worth the trouble. You will need many power tools and expensive materials. In the end, it will cost a lot more money than buying one from the market. And the result will be lacking in sound quality, and its structure will probably fall apart. Some things are better left for the hands of expert craftsmen who have been doing this all their lives. You could, however, create a high-quality drum throne on your own if you want to. How can I learn how to play the congas? The Internet is your best friend, just as it would be if you wanted to play the elusive snare drum. Most people learn how to play this mysterious instrument from Youtube or websites like Skillshare since they don’t have to invest a lot of money. Plus, you can replay the videos anytime you’d like, without annoying anyone. As an alternative, you can find plenty of books on the topic. If you have a higher budget, we recommend finding a teacher in your area, but that might be hard to do since they are not common. Furthermore, they can be expensive. As a side note, you could invest in a beginner drum set and not in just a single conga for better results.